When I was five or so, my grandmother came to visit and we made Christmas cookies. I remember sitting around the kitchen table, that is now on my back porch, with bowls of sprinkles and candies to decorate the sugar cookies I had cut out myself. When all was said and done, I remember telling my grandma that I had the BEST time and that I wanted to do it again. She laughed and told me she was glad I had fun. 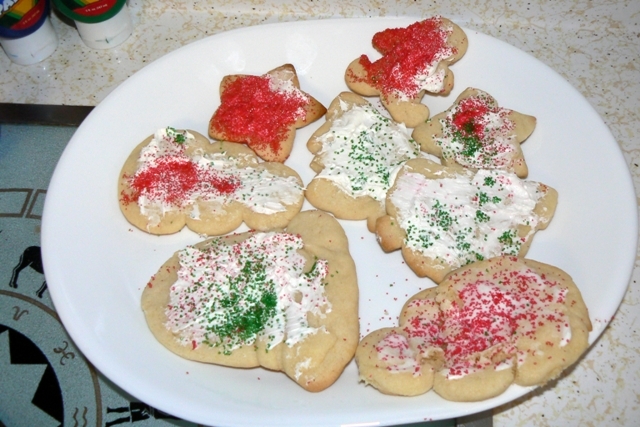 For years after that, I remember hearing her tell that story and saying that she was so tired after making those cookies with me that she thought she would never be able to LOOK at a sugar cookie again, much less decorate them with a grandchild. I can relate to my grandmother in a way I never thought I would! These are the photos from our Christmas Cookie endeavors. The kids were great. Little DID dump the majority of the red sprinkles on the table and Bubba kept pressing the cutters into the dough and not letting me put the cookie on the pan – so he had a beautiful disply of stars in the dough at one point. The best part of the whole thing was that I forgot what time it was and looked up to see that KB was crying because it was time to be fed. At this time the cookies were in the “being eaten” phase and everyone was going to be done at any minute – meaning sitting at the table was going to become harder and harder from that point on. So, I went and got KB, put her in her bouncy seat, put Little and Bubba in the tub and fed KB while sitting on the toilet watching the other to play in the tub. What kind of world do I live in? I can’t tell you how many times I’ve nursed in that same position…oh the joy.